CLUCKING CHILLY: Claire and friends brave the freezing conditions. A WELSH hen party sent temperatures soaring after their flight to the Costa del Sol was cancelled due to bad weather. 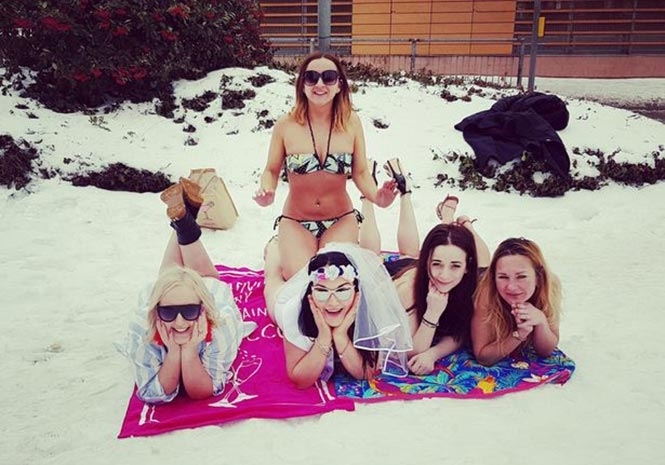 Claire Phillips, 39, plus hens Shari Cadmore, Laura Garlick, Hannah Evans and Emma Davies slipped into skimpy swimwear before posing in the icy conditions at Cardiff Airport. The ladies were on their way to Marbella for the weekend when their flight was axed. And they made up for the disappointment by putting on an eye-popping display in the snow. They decided to hold the party in Cardiff before stripping off for the racy photo shoot, with pedestrians and even a bus driver stopping to take snaps. “It was so funny,” she said. “We were out there for around 25 minutes. “We walked up to an area with loads of snow and a bus pulled up with loads of tourists. And the mum-of-three said that the gang are hoping to reschedule their Spanish holiday after the wedding. Previous articleWATCH: Babbling brook turns to spectacular waterfall – but it’s NOT in Andalucia!